Once a publication is published, its layouts are typically archived to Elvis and subsequently removed from Enterprise. There may come a time though that these layouts need to be restored, for example to use them as the basis for a new publication. The layout is copied from Elvis to Enterprise Server. A copy is created of the layout; you are asked to enter a name for the layout and you can save it to any Brand of your choice and set all of the properties for the layout. Any articles or spreadsheets that are placed on the layout are copied from Elvis to Enterprise Server in the same Brand and Issue as the layout. Note: Restoring other file types such as videos, audio files, article files for Adobe CS3 or earlier and so on is currently not supported. Step 1. In InDesign, log in to Smart Connection and Elvis Server. In the Elvis Desktop Client, right-click the layout and choose Open with Default Application. In the Pro client, right-click the layout and choose Open in InDesign. 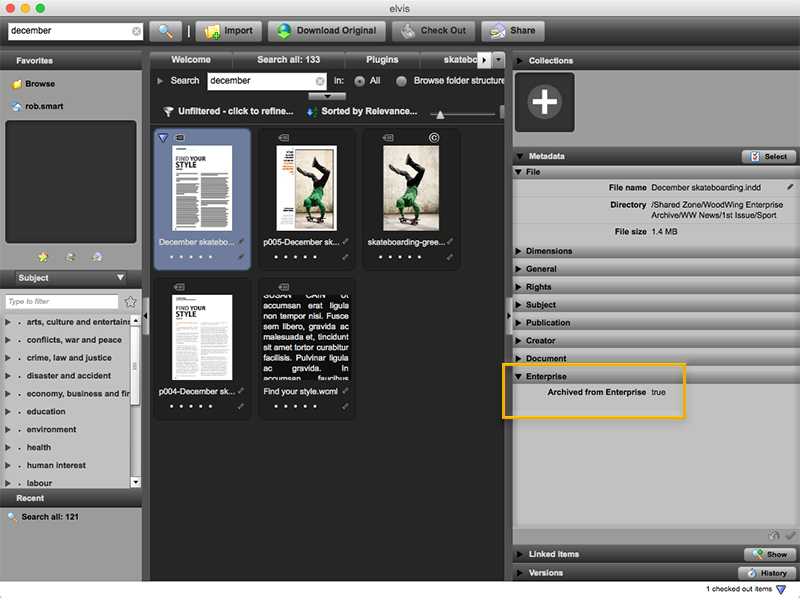 For archived layouts, the Enterprise property 'Archived from Enterprise' will be set to 'true'. The layout is opened in InDesign. Step 3. Restore the layout by choosing Smart Connection > Restore from Archive... . The layout is restored. During this process, various dialog boxes and messages appear. Step 3a. 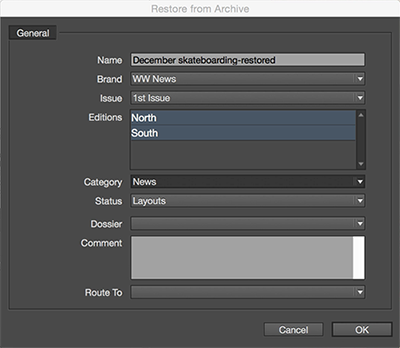 In the Restore from Archive dialog box, enter a name for the layout and set the properties for it such as the location where the layout should be stored, its Status and so on. Step 3b. 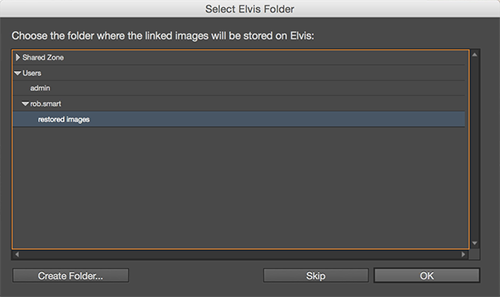 (Optional, only when the layout contains placed images, only when restored images are copied in Elvis, or when the asset is not stored in a Production Zone folder) In the Select Elvis Folder window, choose the folder where the placed images should be stored (this can either be an existing folder or you can create a new folder). Choose Skip if you do not want to restore the images (the layout will still show previews though of the images to give you an idea of the content that used to be placed there). Locate the layout in the Smart Connection panel or Elements panel. Open the Smart Connection menu: all regular commands should now be active. When the layout has been added to a Dossier: open the Dossier panel (Windows > Smart Connection > Dossier). The layout is shown with all its placed content. Step 4. (Optional, only when the layout was checked-out from the Desktop client. When this was done from the Pro client, the layout is automatically checked-in) Return to the Elvis Desktop Client, access the Check Out tab and cancel the check-out for the layout that you opened in step 2. 13 December 2016: Updated the conditions when a folder needs to be specified. 10 November 2016: Re-wrote the system requirements. 2 November 2016: Added Enterprise Server 10.1 or higher as a requirement for using the feature in which images are copied from Elvis to Enterprise and where the Enterprise image is placed on the layout.